Microsoft dominated the software market during the first half of 2013, earning more than twice the revenue of other vendors, according to research firm IDC. Data released Wednesday by IDC indicates Microsoft generated software revenues of $39.9 billion during the first half of this year, followed by Oracle with $15.4 billion, and IBM with $13.5 billion (see chart). The total global software market was $179 billion in the first half of this year, according to data from this month's "Worldwide Semiannual Software Tracker" report, produced by IDC. About half (52.8 percent) of that market was located in the Americas. The report divides the global software market into three segments: "applications," "application development and deployment," and "systems infrastructure software." Microsoft's gained a percentage point of market share in the applications primary market, according to the report. Its strongest applications secondary market was in "content and collaborative applications." Microsoft wasn't the leader in the applications primary market. 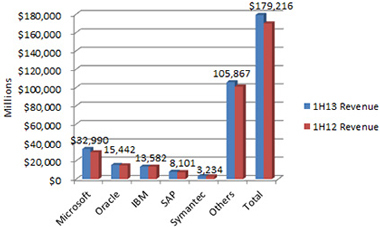 Top vendors in that segment included "SAP, Oracle, IBM and Intuit," according to IDC's analysis. Oracle was the leader in applications development and deployment segment in the first half of the year, with 23.1 percent of the market. However, IDC noted that "Microsoft and SAP experienced the highest growth rates due to the demand for their RDMS [relational database management] solutions." Microsoft led the system infrastructure software segment during the period, according to IDC, with 30.1 percent of the market. Other leaders in that segment included "IBM, Symantec, EMC and VMware." In the first half of 2013, Microsoft led among the worldwide software vendors in terms of its overall year-over-year growth rate. IDC measure Microsoft's growth rate at 12.2 percent, followed by SAP (7 percent), other software vendors (4.7 percent), Symantec (2.7 percent), Oracle (2.4 percent) and IBM (-0.4 percent). IDC noted a couple of trends from the report. Enterprise social networking software grew 28.3 percent year over year. In addition, relational database management software grew 7 percent year over year, which IDC attributed to the adoption of "big data and analytics." Use of big data technology is also tied to the growth of social networking software, according to IDC.